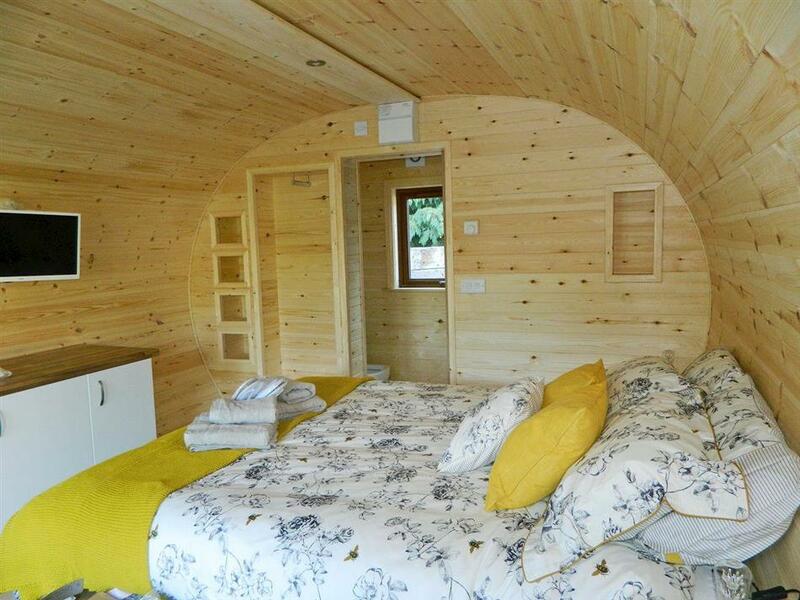 The Honeypot at Honeybee Holiday Homes in Skipsea, near Hornsea, Yorkshire sleeps 2 people. 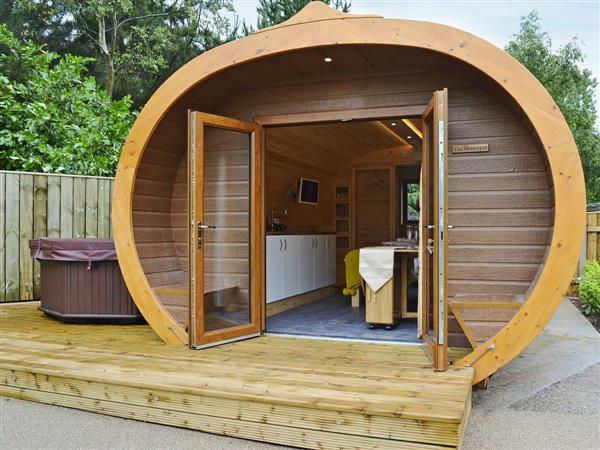 Honeybee Holiday Homes near Hornsea is ideal if you are looking for something a little different, take a look at this contemporary pod. It offers the epitome of luxury for couples who are dreaming of ultimate relaxation. The Honeypot, with its outlook over the garden and trees, has its own private hot tub and barbecue. Built by local craftsmen, the pod has a natural wood, barrel construction (with triple insulation), double glazing and a thermostatic heating system, making it perfect for all year round use. It has a handcrafted king-size bed with a memory foam mattress and designer bedding, as well as a designer en-suite bathroom with complimentary toiletries. Guest slippers and all towels, including those for the hot tub, are also provided as an extra touch. A short walk leads to Skipsea beach where visitors have public access to the beach and golf course (all year), as well the golf bar/restaurant/shop (seasonal) at Far Grange Caravan Park. The traditional seaside resorts of Hornsea and Bridlington are close by. Hornsea Mere offers opportunities for sailing and fishing, as well as being a paradise for birdwatchers. Hornsea Museum is dedicated to the famous Hornsea pottery and the Freeport is ideal for a spot of retail therapy. Bridlington, with its miles of sandy beaches, award-winning promenades and historic harbour provides a leisurely day out, and the Spa features an exciting entertainment programme. There are stately homes to visit at Sledmere, Burton Agnes and Sewerby Hall, and the ancient city of York, Hull, voted the ’City of Culture 2017’ and the North York Moors are all easily accessible. The beach is 800 yards from Honeybee Holiday Homes near Hornsea. With the shop and pub 1½ miles, and the restaurant is 4 miles from Honeybee Holiday Homes. The Honeypot can be booked together with Bumblebee Cottage (ref UK2031 [Bumblebee Cottage]) and The Hive (ref UK2291 [The Hive]) to sleep up to 13 people. Ground Floor: The Honeypot is all on the ground floor. Electric heater, electricity, bed linen, towels and Wi-Fi included. Welcome pack. Access to freezer (shared with ref UK2291 [The Hive]). Decked veranda with garden furniture, sun loungers and barbeque. Hot tub for 4 (private). Bike store. Private parking for 1 car. No smoking. Please note: There is right of way past the pod for guests accessing property ref UK2291. No children. Holidays at The Honeypot, Honeybee Holiday Homes run from Friday to Friday. For a better idea of where Honeybee Holiday Homes - The Honeypot is, you can see Honeybee Holiday Homes - The Honeypot on the map below. Honeybee Holiday Homes - The Honeypot is in North Humberside; should you be on the lookout for a special offer, you can find all the special offers in North Humberside. It's always worth checking to see what is on offer at the moment. Do you want to holiday near Honeybee Holiday Homes - The Honeypot (UK2292), you can see other cottages within 25 miles of Honeybee Holiday Homes - The Honeypot; have a look to find your perfect holiday location.